When New Horizons speeds past Pluto in July 2015, its set of sophisticated cameras and sensors won’t be the only high-tech “eyes” trained on the distant planet and its moons. The New Horizons mission team has officially kicked off its two-year-long Earth-based Observation Campaign, an opportunity for astronomers around (and above) the globe to observe Pluto while New Horizons approaches and passes it. Here’s how the program works: the New Horizons team puts out international calls for its “most wanted” observations, encouraging individual or teams of planetary astronomers to propose observation campaigns to various telescopes. The program’s five phases match the separate stages of New Horizons’ own encounter at Pluto, such as pre-encounter (now through October 2014), immediate approach (April-May 2015), encounter (June-August 2015), immediate post-encounter (September-October 2015) and later post-encounter (April-December 2016). What observations can the New Horizons team expect from Earth? The team unveiled the campaign at last summer’s Pluto Science conference, and has asked more than a dozen of the world’s leading observatories to support the mission. New Horizons scientists led workshops on the program at the European Planetary Science Congress last September and the AAS Division for Planetary Sciences meeting in October, and the team has launched a website that includes sections for submitting proposals and finding collaborators, among other resources. For more on the New Horizons Earth-based Observing Campaign, visit: http://www.boulder.swri.edu/nh-support-obs/. Contact the observation coordinating team at nhobs@boulder.swri.edu. 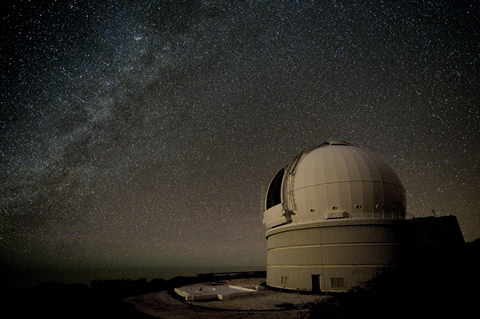 In early May, using the 4.2-meter William Herschel Telescope in the Canary Islands (pictured below), New Horizons Science Team co-investigator Dale Cruikshank led a team that collected spectral measurements of Pluto. Cruikshank and colleagues will use the data to help determine the composition of the patchy pattern of non-ice materials on Pluto’s surface. Cruikshank’s team includes Noemi Pinilla-Alonso, of the University of Tennessee at Knoxville; Vania Lorenzi, of the Fundacion Galileo Galilei; and Javier Licandro, of Instituto de Astrofísica de Canarias.